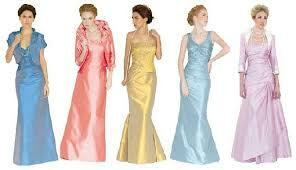 You need a variety of clothing to cover all your wedding activities. From your engagement party to your wedding reception, there are events where you will need a dress. Depending on the type of meal you are planning, rehearsal dinner dresses can vary from casual to formal. You will want something fun and casual if your meal is being held in the backyard. If your dinner is being held in a fancy restaurant, you will want something a bit formal. Shopping for a dress to fit this occasion, you can look online at sites that include Mod Cloth and at bridal shops including David’s Bridal. Retail stores including Nordstrom carry an assortment of dresses that would fit a dinner. A short strapless sateen dress is appropriate for a rehearsal dinner. The simplicity of the versatile dress is flattering. It has a chic look with a ruched bodice and fitted waist. The hem falls just above the knee. David’s Bridal carries this strapless dress in an assortment of colors including blue, watermelon, and wisteria. The dress if lined and it has a back zipper closure. A fun dress for a casual rehearsal meal is a maxi dress. From the backyard to a pizza party, the dress fits the occasion. You can find many designs including this striped maxi. The strapless maxi has a casual feel and flirty style. The fitted bodice hugs the body and the dress flares slightly in an A-line style. The classic black and white colors are ideal for any season. It is available at Mod Cloth. This stylish short dress with a high neck is fashionable to wear to any party or dinner. The ivory colored dress has a fitted bodice, a high neckline with a keyhole cut out, and natural waistline. An exposed zipper and sheer panel at the back add a modern appearance. With a short swing skirt, the sleeveless dress has a flirt quality. The cute dress is available at the Simply Dresses web site. If your rehearsal dinner is a more formal affair, this lovely short lace dress with cap sleeves is an ideal choice. The ivory dress features a scoop neckline, cap sleeves, fitted bodice, and a gathered skirt. The back scoops lower and has a zipper closure. A satin band adorns the waist with a floral accent. The semi-formal dress is available at the Simply Dresses web site. This Jessica Simpson Sleeveless dress features a darling sweetheart neckline and sheer panel. The tiered skirt flows with a flirty appearance. The chic black dress is ideal for all parties. It is made of polyester, is lined, has a back zipper closure, and the hem falls just above the knee. The dress is available at the Belk web site. This dressy black Alex Evenings tiered chiffon and lace sheath dress has classic lines. The soft chiffon tiers overlap and cascade down the short skirt. The cocktail dress has elbow length sleeves and a bodice of lace with a sequined floral pattern. The back zipper is hidden with a hook and eye closure. You can find the party dress at Nordstrom. The soft, flirty, and feminine Jenny Yoo ‘Keira’ Convertible Strapless chiffon dress is ideal for any party. The pleated sweetheart bodice of the strapless dress has knotted twisted shapes. The dress features long panels that can be tied and wrapped over the bodice creating a variety of looks. The skirt is made of tulle crinoline and the dress is fully lined with padded cups and boning in the bodice to ensure a proper fit. The dress can be found at Nordstrom and is available in colors that include black, blush, and plum. For a casual rehearsal dinner, this fun sundress is idea. The Traveling Cupcake Truck Dress in Floral Fruit is a sweet choice for a party. The playful print will make anyone smile with its flowers, strawberries, and butterflies. With a lightly padded bodice and skirt, that has gentle pleats, the halter style dress is figure flattering. The dress has an elastic back, an adjustable and removable strap, and button closure. This cute dress is available at the Mod Cloth web site. A little black dress is a good choice for any event. This black AGB Cap-Sleeved A-line Dress features sparkling bead embellishments on the shoulders. The dress has a scoop neckline, short cap sleeves, lining, and a concealed back zipper. The hemline falls just above the knee. You can find the stylish black dress at the Belk web site. This floral When Springs Fly dress has cornflower blue flowers and a navy blue band at the waist. The short skirt flares from the waistband to fall above the knee. The front has stylish V-neck. The lightweight dress is ideal for spring and summer dinners. It has a lined bust and side zipper closure. The dress is available at the Mod Cloth web site.